The Evolution Series is a line of diesel locomotives built by GE Transportation Systems, initially designed to meet the U.S. EPA's Tier 2 locomotive emissions standards that took effect in 2005. The first pre-production units were built in 2003. 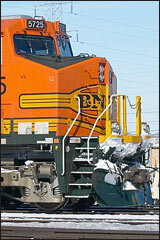 Evolution Series locomotives are equipped with either AC or DC traction motors, depending on the customer's preference. All are powered by the GE GEVO engine. The Evolution Series was named as one of the "10 Locomotives That Changed Railroading" by industry publication Trains Magazine. It was the only locomotive introduced after 1972 to be included in that list. The Evolution Series, mainly the ES44DC, ES44AC, and ET44AC, are some of the best-selling and most successful freight locomotives in United States history, far surpassing EMD's output. Currently, six different Evolution Series models have been produced for the North American market. They are all six axle locomotives and have the wheel arrangement C-C (AAR classification) or Co'Co' (UIC classification), except for the ES44C4 which has an A1A-A1A wheel arrangement and the metric-gauge version developed for the Brazilian network ES43BBi which is B-B-B-B. All North American Evolution Series locomotives are equipped from the factory with a Nathan-Airchime K5HL-R2 "Evolution" airhorn, and most later models are equipped with a Graham-White 373 (electronic) E-BELL. ES44AC recordings courtesy of Brian Marsh and Charlie Brown. The SDH104T1 decoder is used in conjunction with FN12 12 line FX3-type function decoder. SDH104T1 responds as per standard FX3 decoder (e.g. DH163D)for CV1-120. FN12 does not respond to/execute any CV programming in SoundCV (SCV) range CV121-255. Both decoders have CV15/16 lock capability for advanced users. For CV155=01 ["Semi_automatic Notching"], the Prime mover lowest Notch setting is set by the throttle speed setting. F6 (ON) can increase the Notch and F7 (ON) will decrease the Prime mover to the minimum notch set by current throttle setting. NOTE: The T1 decoder must have SW Version 2 or above to use this scheme and allow SoundTest mode.